The Girl from the Train is a powerful story of tragedy, triumph and love that over comes it all. It captivated me from the beginning and little Gretl Schmidt, stole my heart. WWII is in full force and Hitler’s evil has begun destroying lives. Through it all a little girl is caught up in the storm. 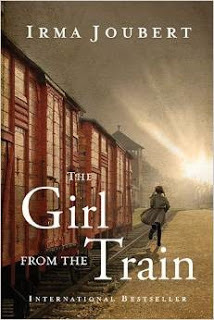 When her wise grandmother manages to force her off of the train bound for Auschwitz, Gretl finds herself alone, afraid and at the mercy of whomever she should come across first. Jakób Kowolski is determined to fight for the cause of his country but finding a lost little girl changes the course of his life and he finds himself wanting her protection more than anything. It’s almost always sad, because people go away,” she persisted. Passed from one person, one house, and one name change to another, Gretl Schmidt eventually becomes Grietjie Neethling and through her sorrowful journey of saying goodbye to those she loves, she eventually finds acceptance and love in a family to call her own. But her longing for Jakób never ceases. My heart broke for little Gretl as she is left behind repeatedly. Unwanted, unloved and rejected by so many…all because of her race. Yet, her courage is undaunted. I love historical fiction and have read many books set in this time period but this was the first time I’d ever heard of orphan children being sent to Africa. So along with a great story, I got a history lesson. This book will leave you satisfied because in it, there is comfort and courage. There is joy and sorrow. There is a confidence that love conquers all. I received this book from The Fiction Guild and Thomas Nelson Publishing in exchange for my honest review which I’ve provided here.